Much has been written about the Turnbull family who arrived on the ship Coromandel in 1802 as members of a group of Presbyterian emigrants from London of Scottish and northern English background. They first settled at Toongabbie, then soon after took up grants on the Hawkesbury River. For a good source of information about this group read Pioneers of Portland Head by R M Arndell, 1976, ISBN 0 85881 019 0. In conducting my research one challenge was understanding the role of Mud Island in the history of several members of the Turnbull clan. As a result I wrote the following article which was published in the journal of the Hawkesbury Family History Group, The Hawkesbury Crier, September 2002. This article was published the journal of the Hawkesbury Family History Group, The Hawkesbury Crier , September 2002. I have found reading about Mud Island in various books to be somewhat confusing so I decided to summarise what I have found in order to better understand the Island’s place in the Turnbull family history. Land Grants 1788 - 1809, indexed by Keith A Johnson and Malcolm R Sainty and published by Genealogical Publications of Australia in 1974. Page 128 - Grant No 1076, 27 April 1803, to Henry Lamb, situated in the District of Mulgrave Place, 70 acres, 1/- quit rent after five years, granted by Governor King. Census of New South Wales - November 1828, edited by Malcolm R Sainty and Keith A Johnson, 1980.
also in the family group are Louisa Turnbull, age 19, and infant Ann. also in the family group are, Mary age 17, Ralph age 14, John age 12, Elizabeth age 10 and Anna age 8. Comment - What is significant in relation to these Census entries is that George is at Lower Portland Head while Ralph is at Portland Head on 70 acres, that is, it is reasonable to conclude Ralph is on Henry Lamb’s grant, when all the following is also taken into account. Pages 113/4 - “Josiah (Everingham) also, would move north with the others but was to marry a Sackville girl he had known since childhood and who had grown up in a stone house at Mud Island. The house still remains as the nucleus of a timber house belonging to Mr Russell Turnbull and is one of the earliest in the area. Earlier we saw how Josiah Everingham had been born at Chaseling Farm, Sackville (is this area known as Sackville or Portland Head? - G Thom) in 1840. This property was separated only by the Dunne Grant, (Portion 48, Ph. Cornelia) from Henry Lamb’s grant, (Portion 47), where George Turnbull, also prominent as a Wesleyan, was to live certainly after 1834, but perhaps as early as 1826, (I think this conclusion is doubtful, eg, see 1828 Census - G Thom) because the Reverend John McGarvie had mentioned passing Chaselings’ and Turnbulls’ (most likely Ralph - G Thom) on his way over to Lower Portland. According to the Turnbull family, the two room stone house was already in existence at that date but for the following reasons, I dont think it was built as early as Lamb’s time. The date of Henry Lamb’s seventy acre grant is April 27, 1803. In June, 1805, his house was burnt down by natives. This house would have been of timber and Lamb was never again in a position to build stone. In a Memorial to Governor Macquarie for land in 1810, just after Andrew Thompson’s death, he stated that he was overseer to the Reverend Robert Cartwright but had been sometime overseer to Andrew Thompson. He had been forced to leave the Sackville grant because everything he was possessed of had been set fire to and destroyed by the natives and he and his family had been in imminent danger of losing their lives. In addition, he had suffered repeated losses in floods, (which started in 1806). If the house were already there before the occupancy of the Turnbulls, which descendants claim to have been the case, then perhaps John Jones had something to do with it. This John Jones may have been identical with the man of the same name who had sufficient knowledge of building to be in charge of the building of St Matthew’s, to erect (wooden) schoolhouses for the Clergy and School Corporation down river and who was connected with Lewis Jones, a stone-cutter. Page 161 - “John Turnbull had moved out of the old house into this smaller cottage. Sons Ralph and George had bought it from the Lambs ten years ago, after the Lamb family had been terrorised by the black natives. The natives descended on them over a ridge of rocks and the top storey had been razed by fire. The upper storey was never restored, but the ground floor with its solid walls, eighteen inches thick, still stands to-day. The Pragmatic Pioneers by Dennis Bruce Gosper, 1991. Page 54 - An hand drawn map headed “Ebenezer - Sackville” shows the approximate location of ‘Kelso’, which is said to be on Henry Lamb’s 70 acre grant. Page 88 - “Russell told me his home was named ‘Kelso’. I thought about this for a couple of days and eventually realised there might be a problem with this, so I rang Russell again. Russell descends from George Turnbull and Louisa Chaseling via their fifth son John Warr. I realised the timing of the naming of the house was critical. Was it named ‘Kelso’, before or after the Turnbulls owned the property. Page 134 - Russell Turnbull tells of the rowboat being tied to the verandah at the height of the record flood in 1867. This indicates that ‘Kelso’ was built either on a high part of Mud Island or just outside the boundary, also see photograph on page 135. Pahe 48 - Copy of a letter by Ralph Turnbull on 1 January 1834 about his Colo River grant, gives his address as Portland Head. Page 49 - In an advertisement in the Sydney Herald on 18 September 1831, Ralph signed as Ralph Turnbull, Portland Head. Note on page 93 a letter dated 2 January 1830 by George Turnbull to the Governor requested a further grant of land but did not mention the 70 acres. Page 32 there is an entry from the Old Registers - Land Titles, showing the sale from Henry Lamb to Thomas Clarkson 1812. Page 113 under “Various Clarkson Properties 1806 - 24 there is a notation at the bottom stating “Lamb’s Farm was sold to Ralph Turnbull. The information from the book Thomas Clarkson - if only, was provided by Naomi Pettiford and added on 1 May 2010. Marriage Certificate of Ralph Turnbull and Mary Ann Reilly (sic) on 24 November 1829, Ralph is described as “of the Parish of Portland Head”. Baptism Certificate of Sarah Turnbull states her parents Ralph and Mary Ann Turnbull’s abode as Sackville Reach - baptised on 4 February 1834. Baptism Certificate of Maria Turnbull states her parents Ralph and Mary Ann Turnbull’s abode as Sackville Reach - born on 25 April 1836. The 1840 will of Ralph Turnbull allowed Mary Ann to live on the 70 acres until their youngest child turned 21 years of age. As their youngest Martha died in 1841, their next youngest Andrew Warr turned 21 years of age on 27 March 1860. I consider the wording of Ralph’s will in regards to the above was not affected by the marriage of Mary Ann to James Ferris in 1844. By the will the 70 acres became the property of Andrew Warr Turnbull on his 21st birthday. The baptism certificate of James Ferris states that his parents James and Mary Ann Ferris were living at Portland Head on 26 April 1846 Their second son George Wallis Ferris was born on 9 March 1850 at Sackville Reach. It is likely that Ralph and Mary Ann (and family) lived on Lamb’s grant from when they were married in 1829 until Ralph died in 1840. Ralph gave his address as Portland Head in 1828, 1829, 1831, 1834, 1836 (Sackville Reach) and 1840 and not once at Colo River. 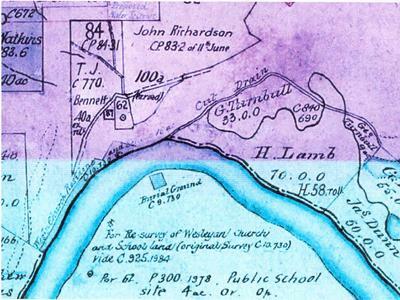 Ralph may have lived on Mud Island as early as 1824 as the block was purchased in 1824, see In the Footsepts of John Turnbull and Turnbulls on the Coromandel 1802 above. After Ralph’s death Mary Ann continued to live there, married James Ferris in 1844, and both probably lived on Mud Island until around 1869 when at least James and his son George moved to Grafton. As yet the date and place of Mary Ann’s death has not been established. George Turnbull and family also lived there or on his adjacent 32 acre grant sometime after 1842. A significant question - is the house occupied by Mary Ann and family in 1841 part of the home called ‘Kelso’ and occupied by Russell Turnbull? The recent picture of Mud Island on page 93 of In the Footsteps of John Turnbull was taken from ‘Kelso’ which indicates the home is sited significantly higher than the Island. Therefore ‘Kelso’ could be located on one of George Turnbull’s grants on the eastern boundary of Mud Island. Finally, is the area of Mud Island in Sackville or Portland Head and is that stretch of the Hawkesbury called Crescent Reach or Portland Reach? Prepared by Grahame Thom (descendant of Ralph and Mary Ann Turnbull) with the assistance of cousins Margaret Miller of Lane Cove, NSW (descendant of Ralph and Mary Ann Turnbull) and Stephen Donald of Gisborne, NZ (descendant of James and Mary Ann Ferris).